Create a Heart Shaped Egg Breakfast for the ones you love this Valentine's Day with these fun and easy ideas. In my house the gift of food is always the way to go. They do say the way to one's heart is through his/her stomach. And of course the most important meal of the day is breakfast right? So this Valentine's Day get a little creative when cooking up your eggs and make the ones you love a Heart Shaped Egg Breakfast. If you are wondering how the heck you are going to do that, not to worry I am going to share with you how right here. It is not as hard as you think and there are many different methods of making your Eggs into a Heart Shape. The other great part is that no mater how your loved ones like their eggs cooked, whether it be Hard Boiled Eggs, Fried Eggs, Scrambled Eggs or Poached Eggs, there is a method for each of them. Have you ever turned your Eggs into Hearts? So how do you turn a Hard Boiled Egg into a Heart? It is not as hard as you think. A very easy way to do it is by using a Heart Shaped Egg Mold. These are really easy and fun to use. All you have to do is boil your eggs and then place inside of the of the mold snap it closed, stick in the fridge and let it set. When you open the mold your hard boiled egg will be in the shape of a Heart. I also came across this other way to turn your hard boiled eggs into Hearts using items you may already have in your home (pictured to the right). Whether your loved ones like their Fried Eggs sunny side up or over easy you can still serve them up shaped like a Heart. To create fried eggs into heart shapes you will need to use a Heart Ring or a Frying Pan with a Heart Cavity. Either one of these tools make it easy. All you do is crack your egg right into the Mold or Heart Shaped Frying Pan and your Egg will form the shape of a Heart. If you need to make your fried eggs over easy just wait for the egg to set up and then give it a quick flip. If you are cooking up breakfast for a hungry bunch then double the love and put two eggs into one mold for double the love and double the yolk. Another fun idea that I do all the time for my kids is what I call "Eggs in a Hole". This is when you take a slice of bread and cut out the middle, in this case you would cut out the middle of the bread using a Heart Shaped Cookie Cutter. Set aside the piece that you cut into a Heart. Then place the slice with the Heart cut out into a buttered frying pan. Next just crack your egg directly into the cut out of the heart. Again if they like their fried egg over easy wait till it sets up and give it a flip. Once that cooks take your Heart Shaped piece of bread you cut out and toss it in the pan with some butter to toast up a bit and serve it on the side for dipping in the yolk. Who can resist these adorable pancake designs. Make shaped pancakes for that someone special with our silicone pancake/egg rings. These won't scratch your pans. Grease and fill pan with pancake batter. When it bubbles, flip pancake onto fry pan or griddle to cook back side. Breakfast is served with cute heart shaped pancakes! Steal someone's heart and bake some heart-shaped cookies with these Kaiser tin cookie cutters. Packed in a set of 6. You can create a Scrambled Egg Heart using the Heart Ring or Heart Frying Pan as talked about above. Prepare and scramble your Eggs and then just pour them into the mold or pan. Now you will not have loose scrambled eggs, but more of an omelet type egg. To make Heart Shaped Poached Eggs the best way is to use a Heart Egg Poacher. This just makes it really simple and easy. You can also use one of the Heart Egg Rings, but that may a be a bit more challenging to use when poaching. To use the Heart Egg Poacher you just sit it in a frying pan within a water bath. Crack your egg into the heart cavity and cook to your desired taste. Easy Peasy !! Sausage Heart with Egg in the Middle - Take a sausage link, slice it in half and bend it into a Heart Shape securing it with toothpicks. Stick it in your frying pan and crack your egg inside. Eggs, Bacon and Toast Hearts - As you see in the photo these Eggs are not Heart Shaped, BUT they can be by using a Heart Shaped Cupcake/Muffin Pan. These are something I made myself and they are super easy to do, but if you used a heart shaped pan they would take on that shape and be great for Valentine's Day. Heart Shaped Quiche - Just create your favorite recipe and bake it in a Heart Shaped Pan. This cast iron pan is 9 inches by 7.5 inches, and each of the heart shape impressions are 2.5 inches in both width and length. Make great treats for petit fours, or individual brownies and more! So are you ready to cook up a Valentine's Day Breakfast for your special someone? Also keep in mind you can make Eggs anytime of day - we have Breakfast for Dinner all the time. It is a fun way to mix it up a little. OK, lots of great ideas here. BUT!!! 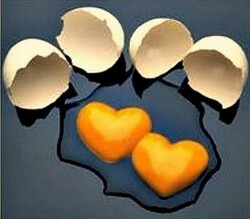 I don't find an explanation of how to do the heart-shaped yolks shown in the picture at the beginning!! Are the yolks cooked a little bit separately in heart-shaped rings and then put with the raw egg whites to finish? How do you keep the yolks from over-cooking then? Please explain to this foggy-brained lady! These heart eggs are adorable! So much fun to share with your loved ones! What an awesome idea! I love them all!!! Some great, fun ideas for heart shaped eggs here. I love the Martha Steward heart-shaped egg in toast. This was a great deal of fun to read. It gave me a lot of ideas for those romantic mornings. A selection of heart-shaped cookie cutters for Valentine's day heart cookies and other occasions. Share the love of Valentine's Day with one of these 5 Easy to make Valentine's Day Cupcakes.